Almost Christmas and a few days ago a MASSACRE started in Ulcinj. Many stray animals were poisoned in the centre and surroundings. Because of the numerous innocent victims, we believe the poisonings were organized. The victims died a horrible death and did absolutely nothing wrong. 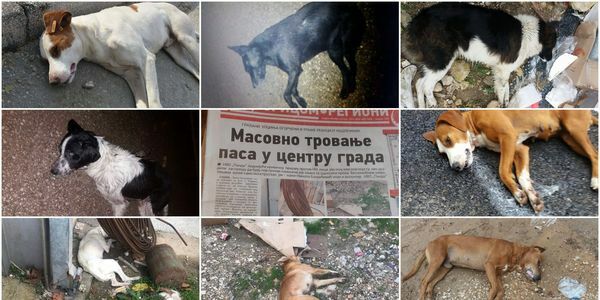 Most were even STERILIZED by animal lovers who give their heart to improve the situation in Ulcinj. As the population will restore itself, the murdered neutered animals will be replaced again by unsterilized street dogs. Further it is important to note that the poison, who is/was spread around town, can be reached by anyone. It could be your child, your pet,... .
We have to let the municipality of Ulcinj know that it is time to evolve. This act was beyond cruel and does not reduce the stray dog population, in contrary. Please share to let the world know what happens in Ulcinj. Ulcinj relies much on tourism and this is how the streets are 'cleaned'. The persons responsible for the poisonings should be punished for their actions. These victims may not be forgotten.